NLP, Neuro-Linguistic Programming, is a branch of psychology that provides a model for excellence. It focuses more on process than content i.e, it discovers how we think and how we do things as well as what we think and do. Many processes are unconscious and produce patterns which are repeated, whereas content is constantly changing. NLP enables us to identify unconscious patterns and by changing these, bring about rapid change that is more fundamental and permanent. NLP can be can be used to improve and enhance any area of life so has application in counselling and psychotherapy, physical therapies, training, business, education, sport and the arts. It provides the practitioner with a model for effective communication, ways of gathering information and has a number of powerful therapeutic techniques to facilitate greater choice, flexibility and lasting change. Maggie La Tourelle is a NLP master practitioner and psychotherapist. 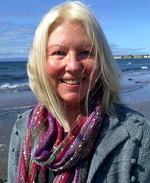 She applies NLP in all areas of her work and has been practising since the 1980s. She is also a holistic therapist and uses a range of therapeutic modalities.